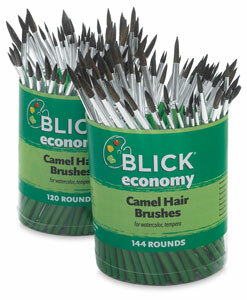 These brushes deliver the superior paint-holding ability of natural hair at an unbeatable price. A popular choice for watercolor painting, each brush has a short natural wooden handle with a green gloss lead-free finish. They are sized just right for watercolor, tempera, or acrylic painting. If popular sizes tend to wear out or be used up more quickly in your classrooms, replenish canister sets by ordering those sizes individually.